Hi, Outsiders. It’s Chef Stefan here. 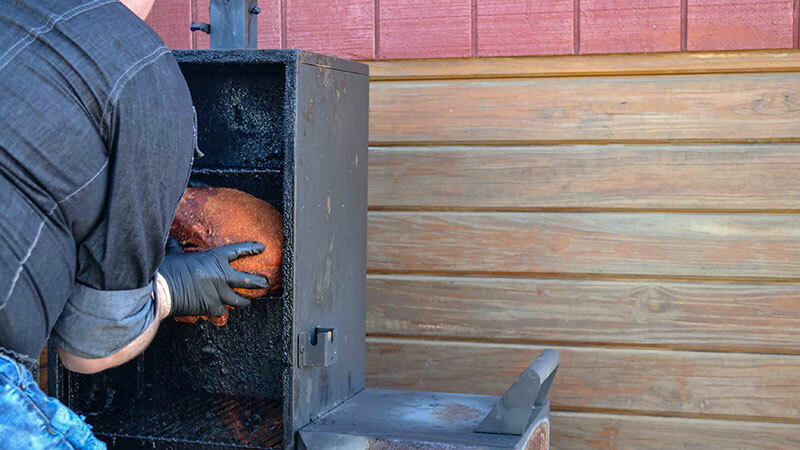 I’m a BBQ fanatic and I’m not alone: we smoked close to 5,000 pounds of pork last season at the Mountain Grill! My grandmother is my BBQ inspiration. She used to make BBQ every summer in the oven using picnic roast (pork) and chuck (beef). She’d keep it in Cool Whip containers! Although it was not traditional, it was always a treat. There are many styles of BBQ with varying techniques, meats, and sauces. I’m partial to the Memphis, Carolina, and, of course, Virginia styles. There’s also Alabama style barbecue that uses a mayonnaise-based sauce similar to coleslaw dressing, Kentucky-style with mutton (I’m not a fan), and Texas, which is famous for its beef. BBQ, by strict definition, is only pork—so Texas and Kentucky technically don’t count! 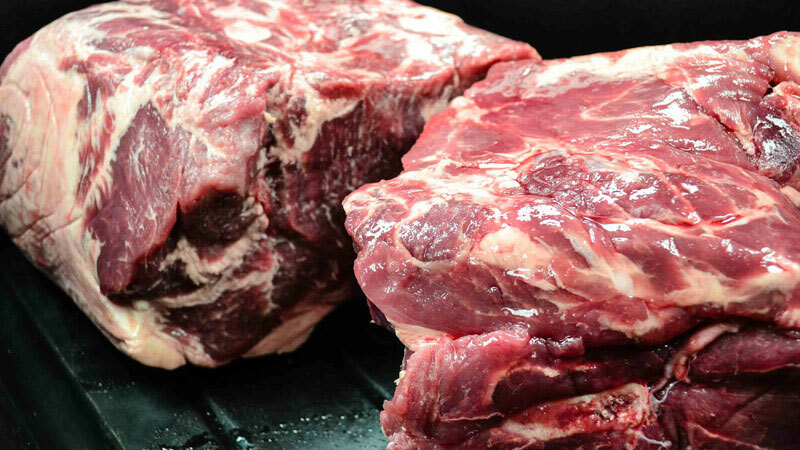 The history of BBQ is fascinating too, but we can save that for another time. Our “Old Dominion” spice rub includes chili powder, smoked paprika, brown sugar, white sugar, salt, granulated garlic, ground mustard, onion powder, cumin, black pepper, and cayenne. 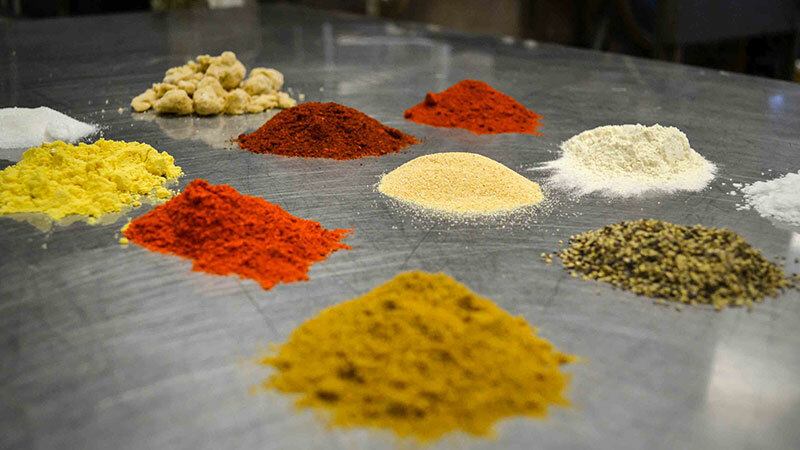 The Mountain Grill’s Old Dominion spice rub recipe is the result of lots of trial and error! There were some not-quite-right rubs in the beginning: some had too much sugar or garlic, some didn’t have enough cayenne. The winning spice rub is a mixture of chili powder, smoked paprika, brown sugar, white sugar, salt, granulated garlic, ground mustard, onion powder, cumin, black pepper, and cayenne. This rub is not a one trick pony; it can be used for anything that works with BBQ flavor. I like it on buttered popcorn! Pork is so versatile! It’s similar to chicken but, in my opinion, has a much better flavor. 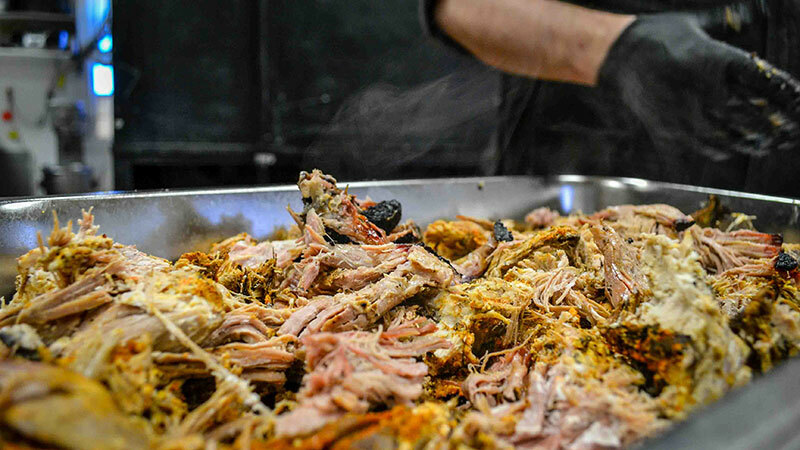 We use the freshest pork butts (that’s the shoulder). I prefer bone-in because you always get tastier, more tender meat near the bone. Depending on the cut, it is sometimes necessary to trim off excess fat. We’re careful not to trim too much, though! Keeping some fat to render down during cooking makes the pork juicy. The pork is treated to a spice rub massage and left to marinate overnight. Have you noticed our smoker on the side of the Apple Barn? One of factors that makes Carter Mountain BBQ unique is that the wood in the smoker comes straight from the orchard. The wood is a mix of applewood and hickory, which really brings out the pork’s flavor. The meat cooks low and slow for between 8-10 hours. It’s all science! Back in my culinary school days, I actually wrote a 10-page dissertation on the chemistry of smoking pork and its chemical breakdown. Science is delicious! Once the pork is out of the smoker and slightly cooled (if you can wait—I often burn my hands snagging a bite of fresh-from-the-smoker bark! ), it’s pulling time. The meat is super tender and pulled just right, not chopped. Pulling preserves the luscious, stringy texture of the pork. 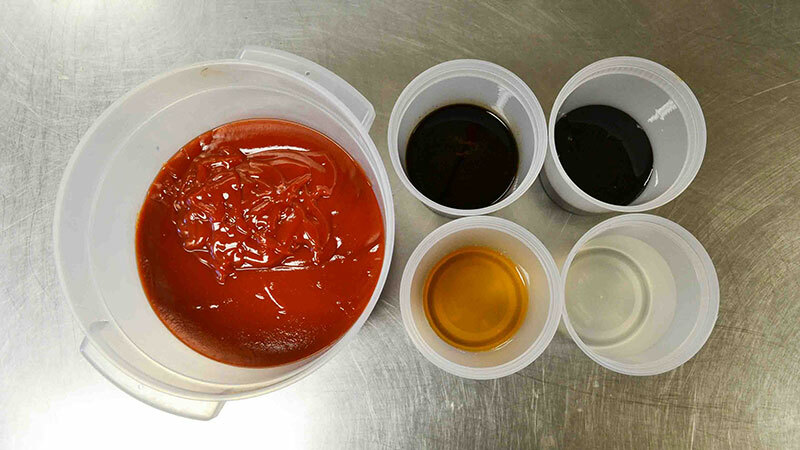 Our “Old Dominion” sauce combines ketchup, Worchester sauce, apple cider vinegar, water, and molasses. Our Old Dominion sauce combines sweet and heat but doesn’t let the spice overpower the palette. The sauce combines ketchup, Worchester sauce, apple cider vinegar, water, and molasses. Molasses isn’t used much anymore, but it’s your best friend in the BBQ sauce game. It lends a nice sweetness to sauces and wet rubs. The finishing touch is a generous handful of the sauce’s namesake: our Old Dominion spice rub. For the BBQ lover who craves variety, our Country Store is packed with other unique sauces, including our Apple Butter BBQ Sauce, Peach BBQ Sauce, and Hot BBQ Sauce. The Mountain Grill serves the pork “naked”. It has just enough seasoning to let the smoky pork flavors shine—but I highly suggest topping it with sauce, too. 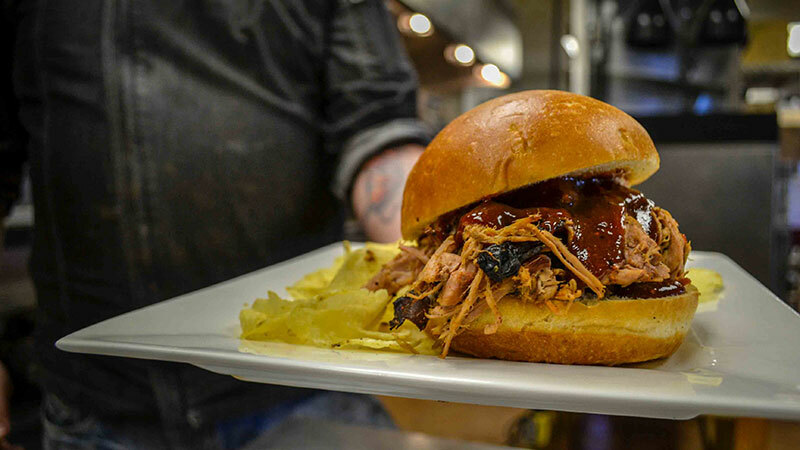 The pulled pork BBQ sandwich is served on a fluffy, buttery challah bun and, if you wish, a side of homemade coleslaw. And nothing compliments a sandwich like a crispy dill pickle spear, hand-cut fries, and ice-cold, fresh-pressed apple cider! If you’re hankering for a snack, we are introducing our signature BBQ empanadas this season. Baked golden brown and filled with smoky BBQ that’s been sauced just right, they are the perfect handheld treat. Whether it’s a sandwich or empanada, there’s nothing better than eating BBQ outside. C’mon out!